Just had to share this gorgeous photo with you. Our chevre is divine this season, so creamy, velvety and bright in taste and texture. We wanted a hearty breakfast when we came in from the barn, so we tossed four free-range eggs, 1/2 cup goat milk, two handfuls of chopped spinach, and a small handful of chopped fresh marjoram and rosemary into a pan, dropped five tablespoons of ultra-fresh chevre in atop the bubbling egg mixture, and let it get good and brown on the bottom before folding and finishing the fry. It was scrumptious! These appetizers are so festive looking, they just sing HOLIDAY PARTY! 1. Combine nuts and peppercorns in a small bowl for coating. 2. Using a fork, combine cheese, chopped rosemary, and oil in a medium bowl; chill 15 minutes. With palms of hands, roll scant teaspoonfuls of cheese mixture into 32 balls (3/4-inch in diameter). Roll balls in batches of 3 in pistachio mixture until coated well. 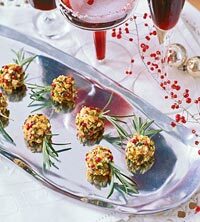 Skewer each with a rosemary sprig and arrange in a single layer on a serving tray. Chill at least 15 minutes before serving, and then allow appetizers to nearly come to room temperature for best flavor. Makes 8 servings.